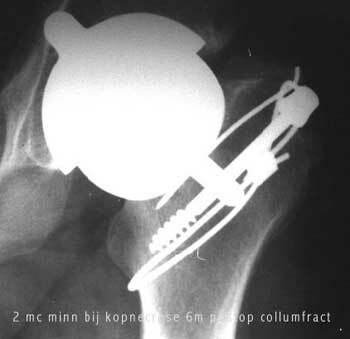 Complications after Resurfacing arthroplasty of the hip in extended necrosis of the femoral head. Uitgebreide femurkopnecrose die 1/2 van de kop omvat. Het gesekwestreerde bot ligt los. Extensive femoral head necrosis with Sequestration of half the caput femoris. Mc minn resurfacing met valgisatie. Het necrotisch bot werd verwijderd. Mc minn resurfacing after removal of the loose sequestae. The femoral prosthesis in valgus position as required. 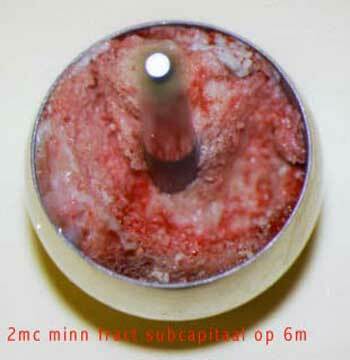 Bone grafting of the defect was performed. progressieve resorptie van kop en hals resulterend in subcapitale fractuur. 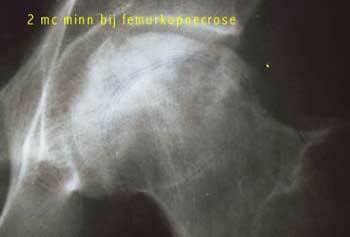 After 6 months: progressive resorption and collaps of the femoral head resulting in loosening and fracture. 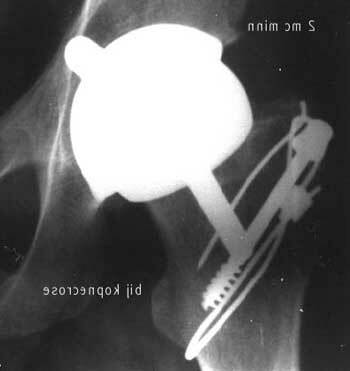 View of the subcapital fracture.